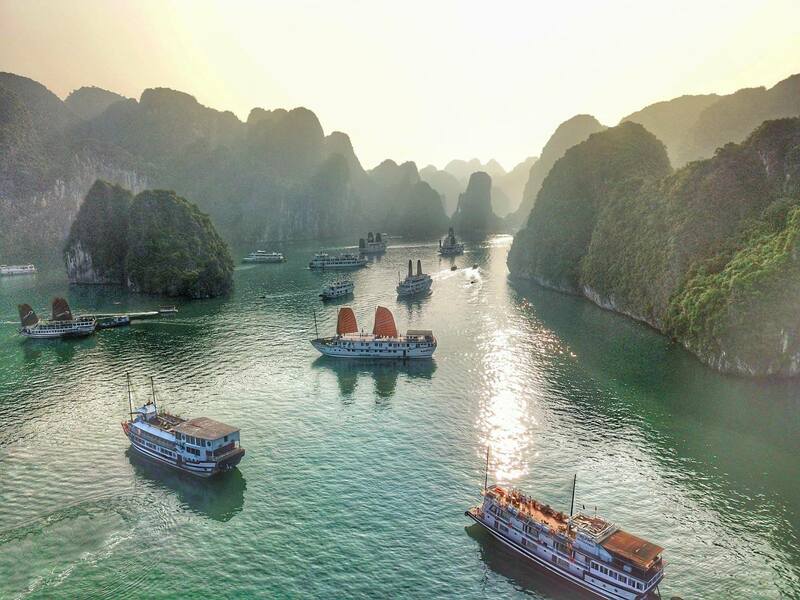 Vietnam is indeed a destination for truly adventurous souls. It’s a place that will make you remember every single thing you did there even after you leave. Various images, sounds, scents! We are here to share our ultimate adventure in Vietnam, what to do there and share as many feelings as possible. Off we go to Vietnam! Seems that that Saturday morning that we had a direct flight from Athens to Singapore with Scoot, would be just the very beginning of a life changing trip. After we had spent two great days in the beautiful Singapore, we got ready for our next morning flight, using Scoot again, this time with Vietnam being our next destination. And this, my friend is how we ended landing, three hours later in a new country ready for a new and welcomed adventure. Right after landing and claiming our luggage, we met with our driver in the arrivals hall as he was waiting for us with a welcoming wide smile and holding a tag with our names on it. We headed in the bustling city and we stuck our faces gazing at the thousands of motor scooters , the tall and narrow houses and whatever our eyes could capture. This is how we finally reached the place where we were supposed to stay in, the Old Quarter. This region is there from the Imperial Times and is what we call today the center of Hanoi. A densely populated area and full of energy is exactly what you need to get the authentic vibe of Vietnam. What we saw and experienced. If you want to see the original “madness” of Hanoi accompanied by a great view of the Hoan Kiem lake you should go to the crossroad of this specific mall. It is a trademark of the city, that will leave you in awe with how the cars are moving, especially the motor scooter in a huge crossroad that does not have traffic lights! In order for us to enjoy the view we visited a small café right across the mall. A lake that one can see like an oasis in the center of Hanoi! You can enjoy your walk gazing how the locals and small merchants live, tourists enjoying romantic moment. A really pretty spot there is the red bridge (The Huc Bridge), as well as the small tower (Turtle Tower) that are illuminated at night. Vietnam is a country that has a really painful history background. Numerous conquerors, war and a lot of pain. Paying a visit to the Hoa Lo museum will be a real food for thought for you, that you seek it. Hoa Lo that is basically a prison, which the French colonial occupiers used in order to keep there the Vietnamese communists of that period. Later, the same prison was used by the Vietnamese to do the same with the American soldiers. As one obviously understands, it is not exactly what you can call fun, but is definitely interesting. A real sample of the perfectly preserved Vietnamese architecture is this temple that honors all the fellow scholars and it is dedicated to Confucius. It was established by the emperor Ly Thanh Tong back in 1070 and it is simply magnificent to behold. We came to realize that this place is used for the graduation ceremony of the students! A contemporary dedicated to the women of Vietnam! In this museum, you can see the life of the woman through the traditions of marriage, their daily life, the evolving of her current role and her role during war periods. It was a truly interesting visit for those who wish to know in greater depth these women that are the definition of strength. Our excursion began from Hanoi and about 3,5 hours later we found ourselves in Hanlong city, which didn’t have anything special to see. We went straight to the port and from that, we boarded in the cruise ship where we would spend our night. All these plans so far were already arranged plans from the team of the cruise ship (going from and to Hanoi city). This is where we found ourselves dining with 10 people we never met before and being closer and closer to this stunning landscape. The pictures that you can see speak for themselves. In these two days we had the chance to enjoy the sunbeams bursting reluctantly into one of the most gorgeous sunrises we have ever witnessed, we went canoeing, we visited a pearl cultivation farm as well as the gulf’s biggest cave. The cost of this cruise will come at 180-400 dollars for 2 days- 1 night and it’s all inclusive (for two people). If you are able to invest a bit more, do so, this experience totally worth it! What is next after Halong Bay is South Vietnam and to be more specific, Saigon city that nowadays is called Ho Chi Minh. As soon as you reach the city you will realize at a glimpse the differences that the South part has with the North that we were at till now. The city is way more modern with the evident influence of the western elements that the French architecture left. It was anyways colony of the French people. Although we were more fascinated by the Hanoi city vibe, ex Saigon city had also many interesting parts to see. There reason why we will be starting with these tunnels is because, apart from the fact that it takes an hour’s drive to get there and it’s outside the city centre, it is undoubtedly the ultimate adventure in Vietnam and one of the most interesting part of the city. During the war, the Viet Congs had built their own underground colonies in a particular part of the land, located in tiny tunnels where they were protected from their enemies. This is the point where you will be fascinated by the human’s inventive ability when his life is under threat, but you will also get to understand many aspects of the War of Vietnam. This Cathedral, which is located in the centre of the city is a characteristic example of the French influence. Built from French colonists around 1863, its distinctive characteristics are the two domes that it has and are 58 meters each. Right next to the Cathedral, another building based upon the model of French architecture, is the Post Office. Today, the Post Office, serves, apart from what its name states, as a tourist attraction as well. Its trademark is an enormous image depicting Chi Minh’s face. Ho Chi Minh has also other interesting spots, equally attractive, like the War Museum and Independence Palace. Although we didn’t have the chance to do as much as we wish to, due to an unfortunate, yet short illness of one of the two Yabatravellers, (Vasiliki was the screwed one!). Thankfully everything went according to the plan and the end of our trip left us with the sweetest of the tastes from this awesome destination. If you, yourself feel also ready for such an endless adventure, you had better book your tickets here!